You can copy, move, delete, upload, download any file from your OwnCloud server from within Processing. These basic actions can then be triggered by any programs, external sensors or other monitorable activities, as soon as you have integrated I&IC’s OwnCloud Core Processing Library in your Processing project. Share your files with other people or/and be part of the IIClouds OwnCloud ecosystem (see below). Then, by using the I&IC’s OwnCloud Core Processing Library, you can search your files for a given author or a given document version, etc. This is a brand new part of the library that extends the initial set of functionalities. One can get usage statistics from the OwnCloud server you are connected to (CPU usage, memory usage, disk usage (global or per account)), with the idea that it could be used for data visualization, interfaces, etc. 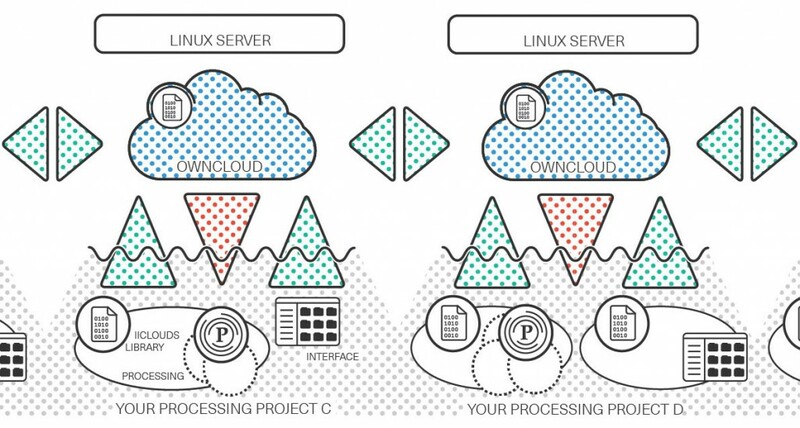 In order to have access to this extended functionalities from “Your Processing Project” (illustrations above and below), you will have to install the new “IIClouds Addon” on the side of your OwnCloud installation or connect your project to a OwnCloud server that did so. You can observe your OwnCloud server more precisely and use these statistics directly in “Your Processing Project”. This is a brand new part of the library as well that extends the initial set of functionalities. As mentioned in “From design research wrap-up to final artifacts”, the “IIClouds Addon” will enhance the OwnCloud interaction experience with a specific structure of directories. Each directory will have a specific built-in behavior ensured by the “IIClouds Addon”. These behaviors can be managed/controlled via the “IIClouds Library”. Taking the example of the TO_FREEZE directory, by the use a the “IIClouds Library” you can decide to freeze content (zip every single file dropped in the TO_FREEZE directory) or let “melt” the content (unzip all archive files). Several processing projects, several interfaces, etc. 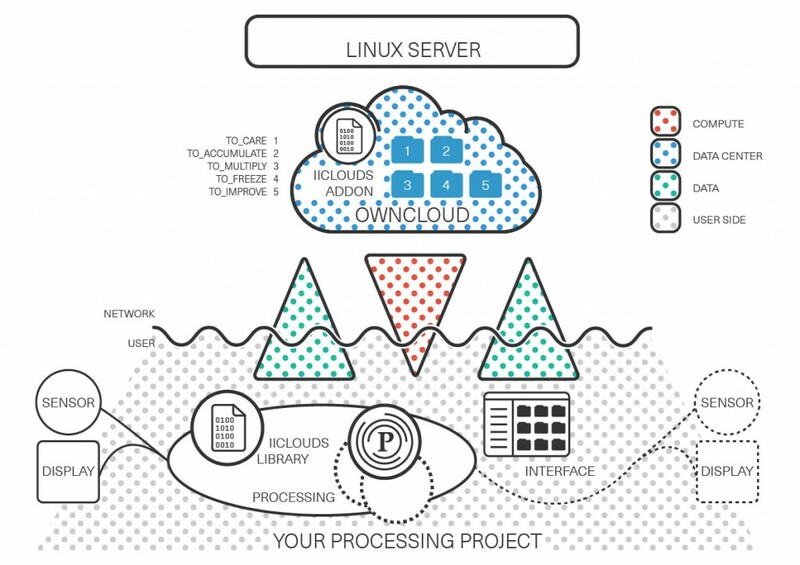 with several OwnCloud Servers (including addons) constitute an IIClouds ecosystem. A project (client) can exchange information with one or several servers. Once your OwnCloud server is installed or from any eligible OwnCloud installation (version > 9.0.0), one can request that a OwnCloud user account may be part of the IIClouds ecosystem/network. By doing so, the concerned OwnCloud account will see a TO_MULTIPLY directory appear (so as To_Accumulate, To_Care, To_Freeze, To_improve that cover different sets of functions). Below, in the conventional interface). By deleting or adding a file in that particular directory, your change will be spread over the entire IIClouds ecosystem. Federation works like a subscription. By subscribing to the IIClouds ecosystem, you will receive all files that any participant to the ecosystem will drop in the TO_MULTIPLY directory, and reversely, any file deletion will be spread over the entire IIClouds ecosystem, meaning that, by deleting a file, it will completely disappear from the IIClouds ecosystem. All described operations/functions can be triggered manually just by manipulating files from your favorite OwnCloud application as well as being controlled/triggered from a Processing application based on any kind of inputs you may want to use. Functionalities and available control will be refined and completed and a full documentation and a complete set of how-to posts will be produced as soon as the version 1.0 of the I&IC’s OwnCloud Core Processing library will be released. The entire code source will be made available to the community.